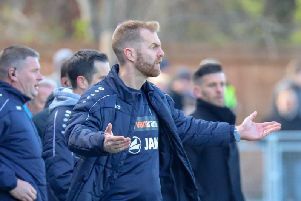 Simon Weaver bemoaned a “frightening” injury crisis at Harrogate Town and admitted that he may be forced to enter the transfer market having seen Lloyd Kerry crocked against Chorley. Four first-teamers are out until the end of the season and Kerry is unlikely to play much of a part in the run-in after being stretchered off in the 18th minute of Saturday’s 2-1 success. The midfielder joins the recently-incapacitated Louie Swain, Luke Shiels and Andi Thanoj on the treatment table, the trio having suffered injuries in Town’s previous two fixtures. And although Weaver had previously outlined a commitment to sticking with his current squad, with only four fit midfielders at his disposal, he has conceded that he may have to look at a short-term solution in the market. “We’ve got loads of injuries, it’s frightening,” he said. “We can’t go a game without a major injury. “You don’t know the full extent until he’s had a scan but it’s a big blow if Lloyd is out until the end of the season. “We’ll have to be looking at what we can do because we are that depleted. Having kept up their side of the bargain by beating the Magpies, results went Town’s way and they are now six points away from the playoff places in National League North. The Wetherby Road chief believes that an ‘outside chance’ of making the play-offs and the incentive of playing for professional deals to be signed over the summer mean that the end of the season will be anything but routine. “The application and the attitude of the lads has been first-rate,” he said. “They are staking a claim for the play-offs and we’re still in with an outside chance. “The pressure’s off us because we have every excuse in the land not to be up there. “Also, lads are looking at getting offered for next season and going full-time for the first time in some of their careers.